The view structure tool displays the view element of the currently opened application as an element tree. It works similarly as the Chrome web inspector tools. Browse through the tree by expanding elements to reveal their children. Select the element to view its details on the elements representation in the tree. 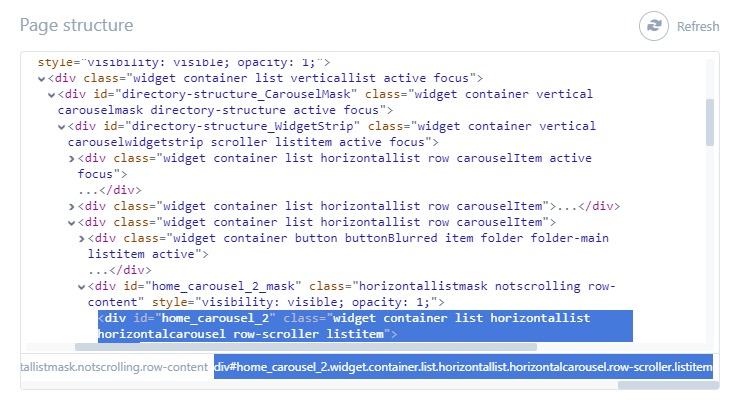 When selecting an element the page structure tool will generate breadcrumbs containing all the parents of the selected elements for easy navigation and also highlight the element on the connected device's screen. Currently the structure tool does not automatically update when the application changes. Update the structure manually as needed by pressing the "Refresh" button.